Since 1950, September is the worst performing month of the year for DJIA, S&P 500 and NASDAQ (since 1971). September was creamed four years straight from 1999-2002 after four solid years from 1995-1998 during the dot.com bubble madness. Although September’s overall rank improves modestly in midterm years going back to 1950, average losses widen for DJIA (–1.0%) and NASDAQ (–0.8%). S&P 500’s average September loss improves slightly from –0.5% to –0.4% in midterm years. 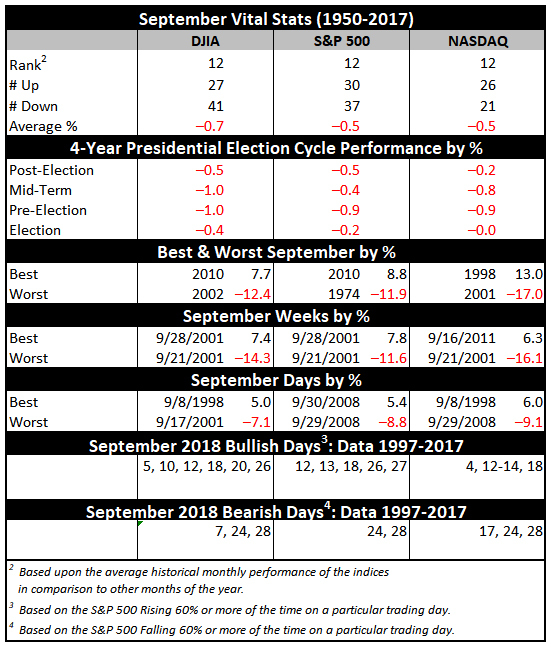 Although September 2002 does influence the average declines, the fact remains DJIA has declined in 11 of the last 17 midterm-year Septembers.